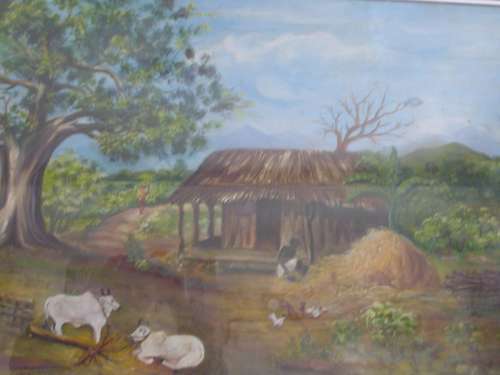 This is a painting done by my mother, who really was an artist! Its a lovely painting ever.Like it!!!!! what a lovely keepsake to have from your Mother. I agree with the other comments. Thanks, Anne. Glad you liked it. How truly beautiful!! One that I know you will always cherish! I love the tree in it also. Thanks for letting us see it. Thanks, Talsi. Glad you liked it. Glad you liked it, Ron. Thanks for the nice comments,Jeba and Rahul. Thanks, Sangeeth. Yes, we do miss her. Her caring nature and values help while managing patients. Marvelous, all praise to your Mother, what a vision she has! You probably miss your mother. Congrats for remembering your loving Mother. Beautiful painting of a lovely pastoral scene. It's nice that you have your Mum's paintings as a reminder of her and another era. Thanks for appreciating the painting. My mum passed away in 1981. Her paintings and her philosophy are constant reminders of the beautiful life we shared with her. Thanks for the comment,Shrinidhi. With the rapidly changing Indian villages, thatched huts are a thing of thr past except perhaps in remote tribal areas! the painting is very beautiful!